Do you play bridge or know someone who does? 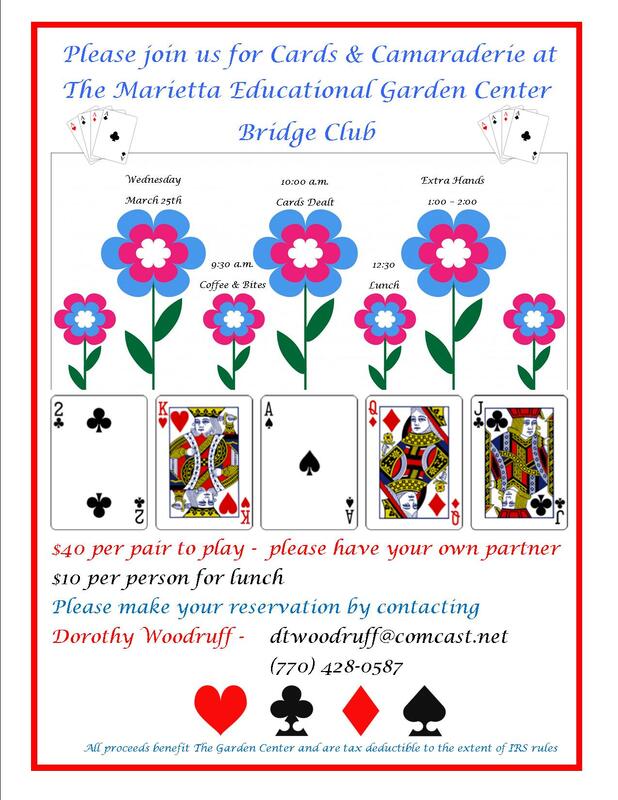 Join us for Cards and Camaraderie at the Marietta Educational Garden Center Bridge Club on Wednesday, March 25 and raise money for the MEGC. Volunteers are needed for a fun morning of decorating and socializing as we get the Garden Center ready for the holidays. Hot chocolate, coffee and many hands will make this a quick effort that will bring much joy to our community! You Don’t Want to Miss Our Next Council Meeting! In addition to our business meeting, we will have a bake sale. Please bring a baked good to sell and/or come to purchase some Thanksgiving delights! We will also be selling a few garden-themed books that have been donated to our Council. But the fun doesn’t end there! Our speakers Carrie Kennedy and Lexis Hay, Proprietors of Screendoor Events and Design will give us new ideas for decorating our homes for the holidays. Lexis Hay has been designing events for over two decades after moving to the United States from New Zealand as a part of her late husband Stewart’s business. She and Stewart believed that bringing people together to celebrate life is always appropriate and essential to a life well lived. Now, Lexis intends to carry on this tradition by pouring her creativity and passion for celebration into styling homes and designing extraordinary and unforgettable events. As a mother of four children turned adults, Lexis is a proven multitasker and skilled organizer who is focused on ensuring her clients receive a high quality experience. Landscape Design School | Registration Now Open! This curriculum, offered in a series of four courses, covers a wide range of subjects: landscape design and its history, landscape architecture and horticulture in the landscape. After successful completion of all four courses students will become Landscape Design Consultants. The general public may attend, but only persons belonging to a federated garden club will receive the certificate. These courses comprise a two-day series of classes and are taught by professional instructors. Required text for the series is Stewards of the Land: A Survey of Landscape Architecture and Design in America ($40 plus shipping and handling) published by National Garden Clubs, Inc. Also required is a subscription to National Gardener. Courses do not have to be taken in chronological order; for instance, if you take courses 1, 2, and 4 in one District but miss the 3rd, you can attend that course in another District at a later time. You won’t want to miss the next Council Meeting! In addition to delicious refreshments and our regular business meeting, our speaker is none other than Dr. Bruce Gillett, one of the area’s leading experts on all things roses. He is a neurologist, a published author, a Lifetime Cobb County Master Gardener and he serves on its Board of Directors. He is an American Rose Society Consulting Rosarian who has helped design and establish community rose gardens such as Rose Lawn in Cartersville and Smith-Gilbert Gardens in Kennesaw. Dr. Gillett’s articles have appeared in newspapers and national publications. His book of love poems, “Quarter-Peeled Oranges,” a tribute to his wife, Dale, who died of breast cancer, has raised more than $11,000 for Susan G. Komen for the Cure. He will be glad to sign books that are purchased.